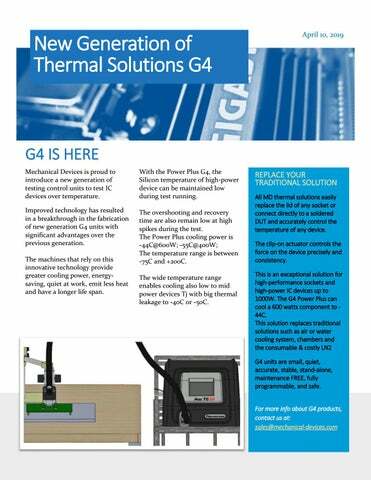 G4 IS HERE Mechanical Devices is proud to introduce a new generation of testing control units to test IC devices over temperature. With the Power Plus G4, the Silicon temperature of high-power device can be maintained low during test running. Improved technology has resulted in a breakthrough in the fabrication of new generation G4 units with significant advantages over the previous generation. The overshooting and recovery time are also remain low at high spikes during the test. The Power Plus cooling power is -44C@600W; -55C@400W; The temperature range is between -75C and +200C. The machines that rely on this innovative technology provide greater cooling power, energysaving, quiet at work, emit less heat and have a longer life span. The wide temperature range enables cooling also low to mid power devices Tj with big thermal leakage to -40C or -50C. INOVATIVE SOLUTIONS TEST YOUR IC DEVICE WITH CONFIDENCE WITHOUT EVER WORRYING ABOUT TEMPERATURE REQUIREMENTS. MD Thermal control units are designed with high performance and flexibility in mind for temperature forcing any kind of package. MD units stimulates the DUT to the desired temperature precisely and consistently via direct contact and real-time temperature control. The units are selfcontained, for real plug and play setup. The system controller contains a touch-screen for temperature control options, and LAN interface for full automation. Condensation free environment is maintained at long cold testing. MD Mechanical Devices is a leading designer, developer and global supplier of thermal control units for testing IC devices over temperature. The units provide accurate, reliable and consistent cost-effective solution, to serve the needs of test engineers. G4 units provide greater cooling power, energysaving, quiet at work, less heat emission and longer life span. Mechanical Devices is headquartered in Haifa Bay, Israel with a branch office in Santa Clara, CA. 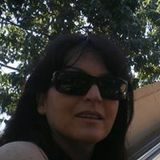 and a number of sale representatives at key locations throughout the United States, Canada, Asia and Europe.